Without Walls announces the appointment of eight new members to its Board of Directors, as well as the full complement of board members for 2018 onwards. This significant expansion of Without Walls’ Board brings together those with sector knowledge and skills alongside new perspectives and insights. Drawn from our existing networks and through an open call, the eight new Directors will join the existing Board of two directors and Josephine Burns, Executive Chair of Without Walls to carry the consortium forward during this exciting and dynamic time of change. Joe Mackintosh Chief Executive of SeaChange Arts and Artistic Director of the Out There International Festival of Circus & Street Arts. Josephine Burns, Chair of Without Walls said ‘We are delighted to welcome the new Board Directors to Without Walls. As the UK’s largest, most ambitious network of outdoor arts festivals and organisations. 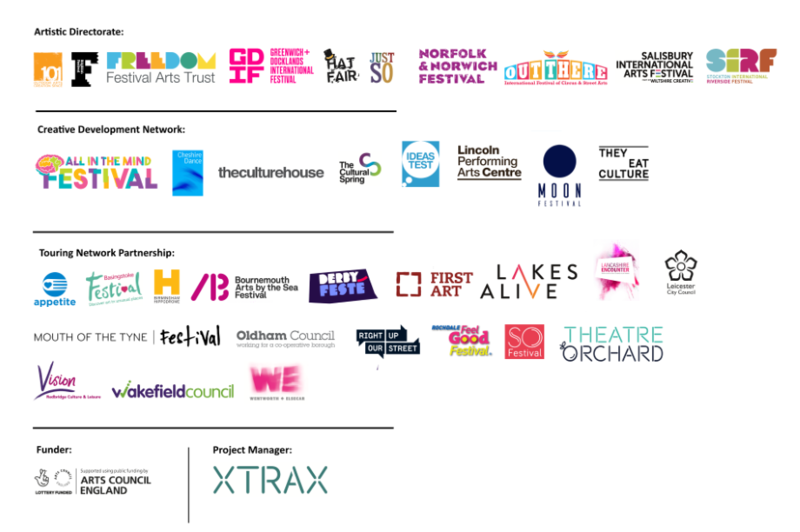 Collective and democratic decision-making by festival directors from across the UK lies at the heart of our operation, managed by XTRAX. This model is central to the success of the past ten years of commissioning ambitious new work for touring. The new Board structure ensures that the undoubted strengths of this model is enhanced by new voices and ideas”. Since 2007, Without Walls has commissioned new work for the outdoors with project funding from Arts Council England and partnership support. It has supported the creation and touring of over 130 new shows that have toured to 22 countries worldwide. The NPO uplift and status from Arts Council England is a fitting recognition of the value of exceptional outdoor performances; enabling on-going commissioning of radical, surprising and thrilling work to attract more people to free events in places where they live, work and play. Visit this page to find out more about the Board Directors.